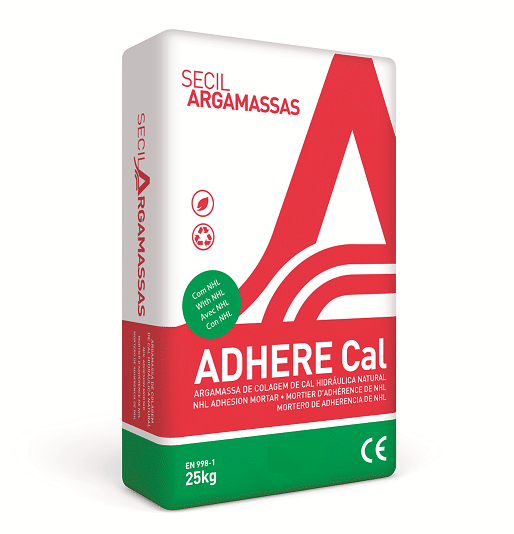 Secil Adhere Cal is a premixed mortar for laying tiles. It is formulated exclusively from natural hydraulic lime (NHL), select aggregates and additives. Use Secil Adhere Cal for laying and grouting tiles or tile work with high absorption. Suitable for the renovation and restoration of old buildings, as well as contemporary homes. Suitable for laying small pieces with high absorption (recommended maximum 400 cm² [20 cm x 20 cm]), on interior and exterior walls. Glasscrete and limecrete floor slab. Secil ecoCORK insulating lime render.